It is my great pleasure to join Tixon’s IDeA mHealth project. I will develop a custom electronics towards mass market as well as create system architecture and manage project development.. Categories: electronics , hardware , telemedicine | Tags: | By: Tomek Cedro. 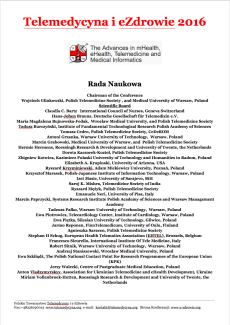 It is my pleasure to be part of organizing committee and scientific board of this cyclic international conference on Telemedicine and eHealth arranged by Polish Telemedicine and eHealth Society. You can click image below to see the full conference program. Categories: science , telemedicine | Tags: conference, eHealth, international, PTTM, telemedicine | By: Tomek Cedro. It was great fun and pleasure to take part in Telemedicine and eHealth 2015 conference organized by Polish Telemedicine and eHealth Society. As a member of organizing committee I managed technical/IT part of the conference. After the conference, during the general meeting, I have been re-selected as a Society Board Member. Categories: science , telemedicine | Tags: conference, eHealth, international, telemedicine | By: Tomek Cedro.